In 2017, New Jersey Division of Fish and Wildlife established an Apprentice Hunting License for archery and firearm hunters with minimum ages of 14 years and 18 years, respectively. Completion of a Hunter Education course is not required. However, apprentice hunters are required to hunt under the direct supervision of a similarly licensed hunting mentor at least 21 years of age. Apprentice hunters, according to survey respondents, took to the field mostly to hunt deer, but also to pursue turkey, waterfowl and small game. Apprentice hunters’ primary motivation to try hunting was to spend time with family and friends; equally motivating was the opportunity to obtain wild meat. (Are you a locavore?) Nearly all participants expressed satisfaction and a positive hunting experience while hunting in New Jersey with their mentor. Both resident and non-residents may purchase an Apprentice License. (See Apprentice License, License, Permits & Stamps.) In our introductory year, a total of 592 Apprentice licenses (227 archery and 311 firearm) were sold to 538 hunters. Apprentice hunters were, on average, 34 years old, ranging from 14–88 years old in 2017. The Division of Fish and Wildlife is excited that over half of the apprentice hunter respondents indicated success harvesting game under the supervision of their mentor! Despite much public misconception that most hunters are trophy hunters, approximately 75 percent indicated hunting for a trophy was the least important reason that they wanted to try hunting. There were 120 female and 418 male Apprentice License holders last year. The percentage of female hunters in the apprentice category (22 percent) is greater than the hunter population at large (4 percent) in 2017. In 2017, 67 established hunters tried a new type of sporting arm as an apprentice hunter: 48 firearm license holders acquired an Apprentice Archery License; 19 archery license holders acquired an Apprentice Firearm License. This fall, (and next spring—gobble, gobble) hunters are encouraged to introduce someone new to hunting through this hands-on opportunity—a co-worker, a family member, a friend or a significant other. Three-quarters of survey respondents felt strongly that the apprentice license provided them with a worthwhile introduction to hunting; 83 percent felt they could hunt independently in the future! Share your love of the outdoors and appreciation for wildlife with someone yet to have the experience. Equally important, foster respect for the game animals pursued, model good hunter ethics—and have fun doing it! Lastly, we encourage apprentice hunters to complete a Hunter Education course to become an annual hunter. By purchasing a hunting license, you make a valuable contribution towards wildlife management and the protection of public natural resources. Visit https://www.nj.wildlifelicense.com/ALS/course/course_report.php for the fall Hunter Education course schedule. How many apprentices will you turn-on to hunting? For questions about the apprentice hunting license as a mentor or an apprentice, contact Ryan Risher at Ryan.Risher@dep.nj.gov or call (609) 629-1014. Convey your knowledge, transfer your skills, lend your gear, share your access and make memories afield with friends and family. 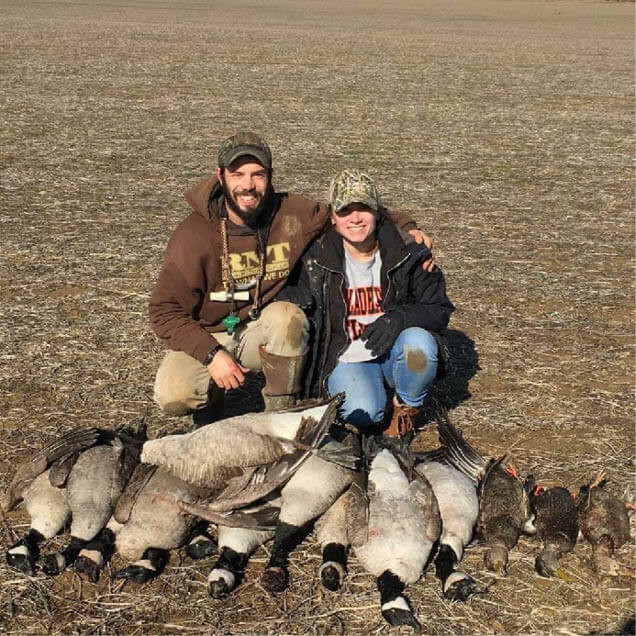 First-time apprentice hunter Jess Kreppel enjoyed a successful day goose hunting in Cumberland County with mentor Ryan Risher. Jess hunted with a 20-gauge Mossberg pump, harvesting two Canada geese and two black ducks.